Weddings are supposed to be perfect — as well as ambitious and highly personalized — and can be hard to pull off, given the expectations. Yet in dozens and dozens of weddings, between the early 1950s and the early 2000s, Ed felt like he batted 1000% since no rings were lost and no catastrophes occurred on his watch. Ed performed weddings for Wake Forest couples, for friends, and for their family members. 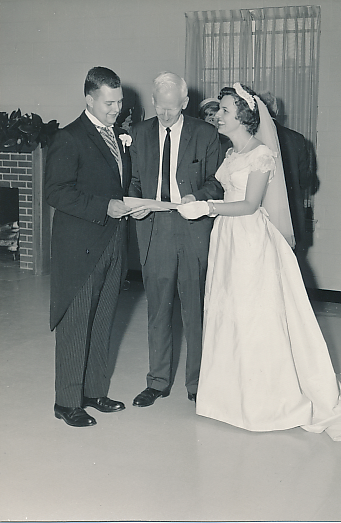 His first wedding services were for John and Ann Madison, May 1955; Gray and Hilda Boyette, July 1956; and John Frederick and Norma Turnage, September 1959. Weddings in the early 1960s included those for Glenn Jr and Jerri Blackburn, Jason and Melinda Mori, Don and Meyressa Schoonmaker; Van and Becky Brown; Sybil and Opie Wells, Joe and Eva Clontz; and David and Becky Jo Funkerburk, many of whom became life-long friends. Ed performed the wedding of Joe and Eva Clontz, WF graduates. Over his career, Ed performed weddings of every scale and setting — large and small, formal and informal, indoor and outdoor, held in churches and in courthouses, sometimes sharing the podium with another minister or rabbi. Ed officiated at the Yale University Chapel in the late 1960s and, 40 years later, at a wedding held on the top of courthouse steps in Sylva, NC. Children attendants often created unexpected moments. At the Sylva wedding, for example, the flower girl stopped mid-way up the steps and would not go further; her father had to carry her the rest of the way. At another wedding, the child serving as ring bearer stopped to sit down with his mother and would not budget. The resourceful mother handed the ring to the boy’s sibling who successfully delivered it to the front of the church. An occasional dog attendant also added novelty. 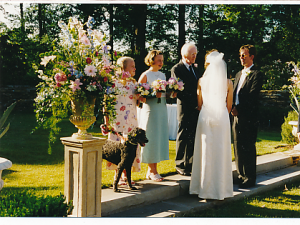 At the beautiful garden wedding of Jan Williams and Larry Murdoch, the groom’s dog Lika accompanied the wedding party up the aisle, and when Ed spoke the groom’s name, the dog barked her support of the union. One and Ed and Jean’s favorite weddings of all time included very special people and a poodle. Photo courtesy of Jan Williams Murdoch. Did Ed perform your wedding? Chaplain Christman performed our wedding June 12, 1976 at Davis Chapel on the Wake campus. He was so great in counseling us before the wedding.. Steve attended Wake and graduated in 1974.. It was a wonderful ceremony and we remember Ed fondly .